Hello, fellow stitchers! I hope you all had some wonderful winter holidays and a full month to recover and catch up on any patterns that you were behind on. A Season of Love…Geek Girls Love! We are entering the month of February which can be a complicated month for many people due to Valentine’s Day. Some enjoy and embrace the season of love (which doesn’t have to be only romantic! Friend, family and self love are super important! <3) with all its hearts and flowers and pink colored things. Some are decidedly anti-Valentine’s Day and wear their black hearts on their sleeves. Some just take it as an excuse to buy boxes of chocolate for cheap on February 15th to eat alone with their cats while playing video games. There’s no wrong way to Valentine’s Day! For this month’s pattern, I went with a theme we can all get behind…a love for geek girls. We are a community of them, united over our common and uncommon passions with the desire for connection with others like us. Starting from the top, we can love our unique selves. We can love our friends who write us letters gushing about the new season of Doctor Who or their most recent D&D session or the intricacies of tea blends. Love the geek girls out there making the world turn with their brains and passion in careers from STEM to pop culture and beyond. Love the sisterhood and empowering community that we create by being a geek girl. 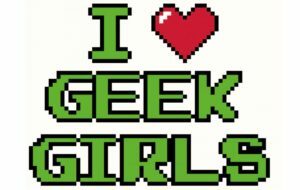 Here is the link for I Heart Geek Girls! Start this pattern from it’s very center: 32 width x 24 height, which should be halfway up the second “E” in Geek. This pattern will be about 3.5″ wide and 4.6″ high. This pattern is pretty flexible! You can go with any colors for the font or heart. I went with something that felt very 16 bit video game inspired. Feel free to swap up the theme! 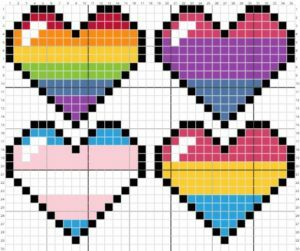 Not only the colors are flexible, but if you want an LGBTQ friendly pixel heart, I provided a few examples including a Pride heart, bisexual heart, trans* heart and pansexual heart. Obviously, this is not an exhaustive list so let me know if you need help adjusting the colors for a different Pride heart! Check out the chart for these hearts! Want to show off how much you love writing to your penpals? Replace the heart with an envelope! This YouTube channel, Peacock and Fig, has a playlist of 15 videos for cross stitch beginners. Check it out! 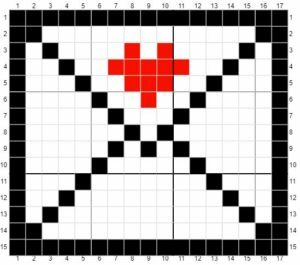 When you post on Twitter or Instagram, use the hashtag #IggleStitch and #IgglesCreate to share your Monster cross stitch progress and see how your fellow Iggles are faring! Feel free to tweet at me or message me on Instagram if you have questions or concerns! What do you think of this month’s pattern? And more importantly, what pattern would you like to see for March? Comment below with suggestions! Level 29 witchy nerd living in the PNW. Loves fantasy, cats and video games.